In order to make the seahorses’ tail curl, you will need to use the long tail of yarn you left behind after fastening off the body. 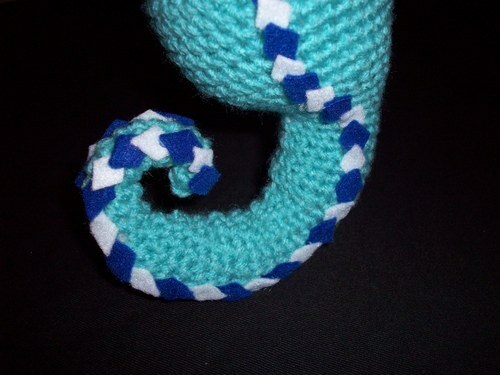 get your wide eyed needle, and weave your yarn up the center of your seahorses body. 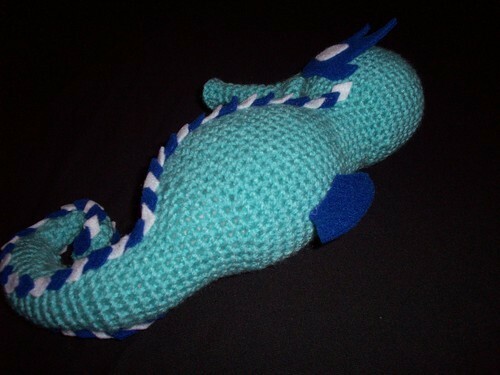 When you pull the yarn tight, the tail should curl with it. The last step in this pattern is to attach the snout to the head and add your own features to the eyes, dorsal fin and scales. I used felt for all my details. 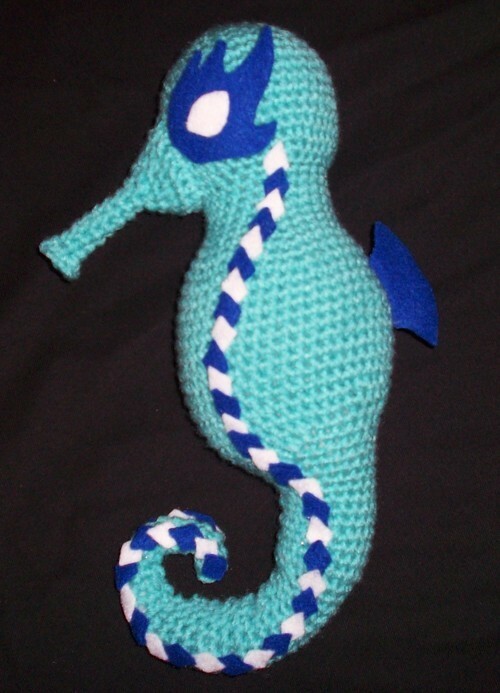 I hope you have enjoyed this amigurumi seahorse pattern. I want to especially thank Aaron and Norma (Aaron’s mom) for helping me cut out all the little diamonds of felt in order to make the line along the side of my Seahorse. OMG! I love this! Its BEAUTIFUL! I’m going to try it when I get home from work tonight! 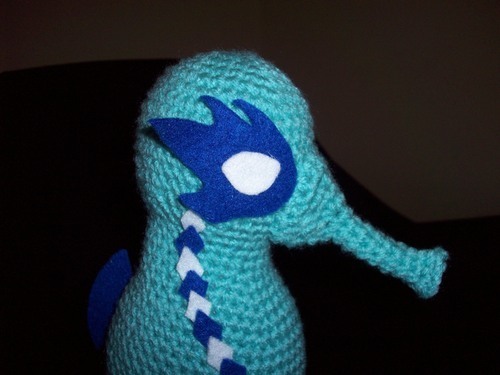 I LOVE this pattern, and am going to make it for my son tonight! Minus the felt beacuse we have none lol! Adorable pattern! I love this! 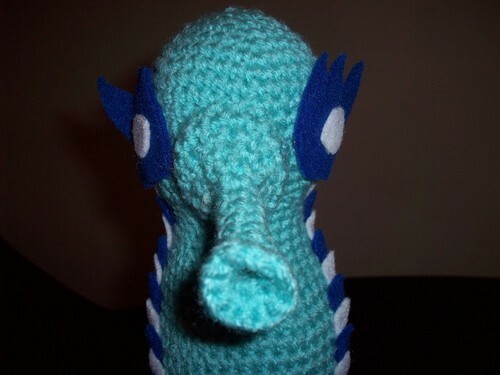 How big did Senor Seahorse turn out? if I remember correctly…like… a foot? I think he might have been a little larger than that, but only barely. Thank you soooo much! After endlessly searching for a seahorse pattern f or my 14 year old girl, I found yours. Must say it’s occasionally tedious. But the relief in doing such a long patt comes when you get through rounds 14, 36, 53, 69 & 83. This patt was well thought out! The most amazing part is that it’s only two pieces!! I’ve made some eyes to go with it & found some fins to accent it on one of your fish patts. I know you said he looks like a luchador… but I think it’d be great if you had a crocheted patt for the details you gave him. Lots of love & if you’d like to see my version of him you can find me on Facebook @ Dee Likeideverleavehim Gonzalez. Again, thank you for your rocking ingenuity. You saved my possible headaches for another project.